From *the Department of Anthropology, McMaster University, Hamilton, Ont. ; the Departments of Microbiology at †Mount Sinai Hospital and ‡Sunnybrook & Women's College Health Sciences Centre, University of Toronto, Toronto, Ont. ; §the Hamilton Health Sciences Corporation, Hamilton, Ont. ; and ¶the Hamilton Regional Laboratory Medicine Program and the Department of Pathology and Molecular Medicine, McMaster University, Hamilton, Ont. Background: Antibiotic therapy for asymptomatic bacteriuria in institutionalized elderly people has not been shown to be of benefit and may in fact be harmful; however, antibiotics are still frequently used to treat asymptomatic bacteriuria in this population. The aim of this study was to explore the perceptions, attitudes and opinions of physicians and nurses involved in the process of prescribing antibiotics for asymptomatic bacteriuria in institutionalized elderly people. Methods: Focus groups were conducted among physicians and nurses who provide care to residents of long-term care facilities in Hamilton, Ont. A total of 22 physicians and 16 nurses participated. The focus group discussions were tape-recorded, and the transcripts of each session were analysed for issues and themes emerging from the text. Content analysis using an open analytic approach was used to explore and understand the experience of the focus group participants. The data from the text were then coded according to the relevant and emergent themes and issues. Results: We observed that the ordering of urine cultures and the prescribing of antibiotics for residents with asymptomatic bacteriuria were influenced by a wide range of nonspecific symptoms or signs in residents. The physicians felt that the presence of these signs justified a decision to order antibiotics. Nurses played a central role in both the ordering of urine cultures and the decision to prescribe antibiotics through their awareness of changes in residents' status and communication of this to physicians. Education about asymptomatic bacteriuria was viewed as an important priority for both physicians and nurses. Why antibiotics continue to be prescribed for asymptomatic bacteriuria in institutionalized elderly people is unclear. One possibility is that the ordering of urine cultures for nonspecific indications and the treatment in cases of positive cultures may contribute to the problem. Diagnosing symptomatic urinary infections in this population is difficult. Because many residents have at least some degree of cognitive impairment, they may be unable to describe their urinary symptoms. However, no association has been demonstrated between the presence of nonspecific symptoms and the presence or absence of bacteriuria. In a study by Boscia and colleagues18 no difference in symptoms such as malaise, anorexia or fatigue was noted between subjects with bacteriuria and the same subjects when they had no bacteriuria. In another study patients with urinary tract infections in a veterans' facility deteriorated nonspecifically with confusion.19 However, all of these patients were also febrile. Although the prognostic importance of nonspecific symptoms is unknown, there is no evidence to support treating bacteriuria for nonurinary indications in this population, particularly in the absence of fever. Actively detecting bacteriuria for nonspecific indications may be an important reason why asymptomatic bacteriuria continues to be treated. The aim of our study was to explore the perceptions, attitudes and opinions of physicians and nurses involved in the process of prescribing antibiotics for asymptomatic bacteriuria in institutionalized elderly people. We chose a qualitative research approach because this research was hypothesis generating, would elicit subjective understandings and would facilitate the development of ideas for possible interventions.20,21,22,23 Focus groups were conducted among physicians and nurses who provide care to residents of long-term care facilities. Both nurses and physicians were recruited using convenience sampling. We invited the medical directors of 11 free-standing, community-based, long-term care facilities in Hamilton, Ont., to participate in focus group discussions. The medical directors have practices in which a substantial amount of time is devoted to the care of residents. To obtain a broader representation of physicians, those attending a meeting of an Ontario committee on geriatric long-term care were also invited to participate. The physicians were either general practitioners or family physicians. Nurses from 2 nursing homes in Hamilton were invited to participate in separate focus groups. They included both registered nurses and registered practical nurses. Focus group discussions were held over 1 month; 2 of these discussions were with nurses and 2 with physicians. Each discussion lasted about 1.5 hours. Each focus group session consisted of a short introduction describing the study to ensure that participants were familiar with the issues and the definition of the problem. All of the focus groups were facilitated by a medical anthropologist whose role was to introduce the topics, ask questions and encourage participation by all group members. Participants were told that the purpose of the study was not to audit practice but to understand their perceptions of the ordering of urine cultures and the prescribing of antibiotics for asymptomatic bacteriuria. Open-ended questions were used to generate discussion in 3 main areas: the decision to order a urine culture, the decision to order antibiotics and possible strategies to reduce the prescription of antibiotics for asymptomatic bacteriuria. During the sessions the facilitator verified with the participants that she had understood the points made. Where possible, the data were triangulated using subsequent focus groups to check information elicited from previous sessions. The study was approved by the Ethics Review Board of the Hamilton Health Sciences Corporation and the research ethics committees of the nursing homes. Tape recordings of each session, made with the participants' permission, were transcribed verbatim and analysed by the facilitator for issues and themes emerging from the text. The study coordinator's notes and summaries were also compared with the transcribed data to clarify statements and ensure completeness in the transcripts. For each session, content analysis using an open analytic approach was employed to explore and understand the experience of the health care workers.24 This method uses no predetermined categories of analysis but instead allows the relevant themes and issues that emerge from the data to guide the coding and facilitate a more detailed understanding of the context and processes related to the problem. This is an inductive and iterative analytic process that seeks out all relevant interpretations and continues until no new information emerges. A summary of the issues and themes identified in the focus groups is shown in Box 1. Of the 11 medical directors, 5 agreed to participate; 2 declined because of clinical responsibilities, 2 were attending other meetings, 1 was on vacation and 1 declined without giving a reason. All 17 physicians attending the committee meeting participated; they had at least 5 years' experience working in long-term care facilities. All 16 nurses who were contacted about the study agreed to participate; there were 8 participants in each of the 2 nursing focus groups. Both the physicians and the nurses repeatedly discussed the kinds of symptoms and signs that might suggest a urinary tract infection and hence the ordering of a culture. They emphasized that there was a wide range of indicators, more subtle than the classic symptoms of urinary tract infection (e.g., dysuria, frequency, urgency, suprapubic pain, fever), that influence the ordering of cultures and the prescribing of antibiotics. Because residents in long-term care facilities frequently have cognitive impairment and are unable to articulate their symptoms, health care providers rely instead on signs of more subtle functional and behavioural changes. A patient might be more restless or confused, more irritable, crying, aggressive, agitated and less compliant. He or she may be falling more or be "off her food ... not up and around the way she usually is ... not herself." As one physician articulated, "We always sort of group together symptoms and signs. I think when you are dealing with long-term care patients there are more signs than symptoms. Sometimes the changes are very subtle." Another physician stated, "I suspect that positive cultures are not in 'asymptomatic' patients; they are in patients that have some changes in their status." Misconceptions about the definition of symptoms of urinary tract infection were also discussed. Although the nurses participating in the focus groups had learned that foul-smelling urine alone was not sufficient reason to order a culture, a number of physicians still felt that this was one of the main reasons why cultures are ordered. "I think foul urine is the most important thing [that triggers a culture]. If we just pass on the concept that foul urine does not necessarily denote a treatable condition, I think this one will make the most difference." Both the physicians and nurses indicated that it is the nursing staff who trigger the ordering of urine cultures because they are the first to notice changes in residents. As a result of their observations, nurses will either initiate a urine culture, with the order being signed later by a physician, or will prompt a physician to order a culture. The physicians in the focus groups indicated that they rely on the nursing staff for this. As one physician said, "The staff know these patients very well. They know them a lot better than we do because they are there every day and they notice subtle changes." A nurse said, "They go by our lead." Participants suggested a number of other factors that influence the ordering of cultures. Occasionally a resident's family feels that something is wrong and will pressure staff to send a culture. Pressure might also come from other staff or managers to obtain a culture "just in case." Although there was no consensus about the issue of liability, some physicians felt this influenced their own decision-making as well as that of some nurses. Other reasons given for ordering urine cultures were admission screening and annual physical assessments, changes in routine urinalysis results, positive dipstick test results and follow-up after antibiotic treatment. The physicians were uncertain about the significance of positive culture results and had different opinions about treatment. The physicians' views varied on the importance of pyuria, positive dipstick test results for nitrites or leukocyte esterase and the number of organisms cultured. Some physicians said they would not treat a patient who was asymptomatic, whereas others would. Some would treat only if urine contained positive nitrites; others said that they do not use this criterion. These kinds of ambiguities, together with the subtle symptomatology that often triggers the ordering of cultures in the first place, make the decision to order antibiotics an uncertain one. As one physician stated, "I'm not sure which way to go ... to look for reasons to treat, or look for reasons not to treat." For physicians who are covering for colleagues or on call, a lack of knowledge about the patient may compound the problem. Some covering physicians said that they would not prescribe and would try to "buy some time" by asking the nursing staff to monitor the resident and follow up the next day if there were changes. Others said they would order something to cover themselves in case complications arose later. The nurses reported that it was common for covering physicians not to ask about symptoms or to ask why a culture had been ordered. They found that some on-call physicians were reluctant to prescribe antibiotics when called about a positive culture, yet others would order antibiotics automatically, without reference to the presence or absence of symptoms. Both the physicians and the nurses discussed at length the issues related to the reporting of a positive urine culture. 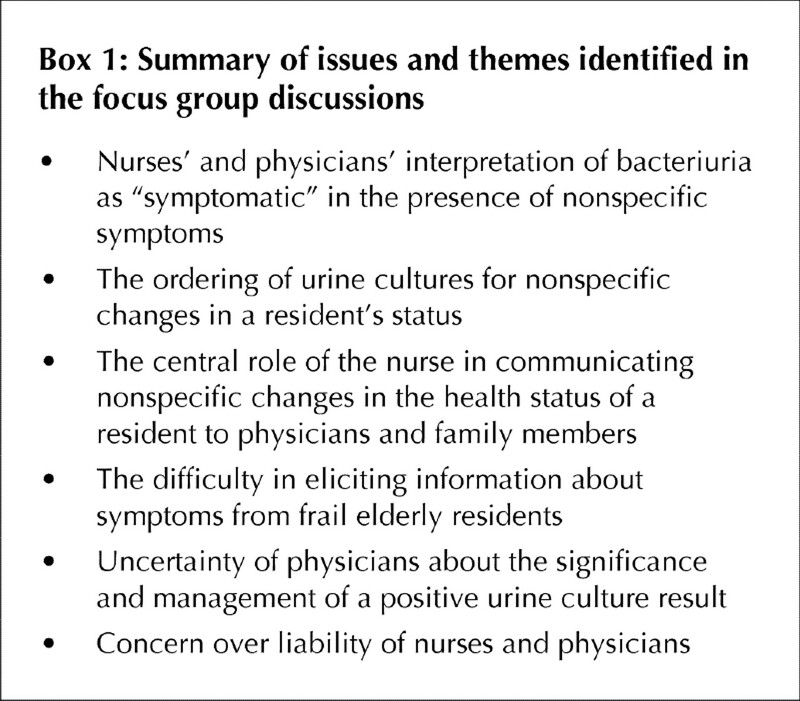 Nurses in the focus groups said that they report all positive urine cultures to physicians, whether the resident has symptoms or not, but they indicated that physicians expected to hear about the clinical assessment too. As one nurse put it, "As long as you give the whole picture of that person, and not just what is on the lab result, you are making it very easy for them to make a decision. What the physician really wants to hear is the total assessment." When the physician does not ask, the nurses said that sometimes they have to "advocate on behalf of the resident by saying 'Look, they are ill, we know it because of these behaviours and the culture came back positive.'" However, physicians indicated that they often do not get enough information when a positive culture is reported and cited a number of reasons for this. Frequently, they are unable to speak with a staff member who knows why a culture was ordered; this problem is exacerbated by casual, part-time staffing and by the fact that the clinical details that triggered the ordering of the culture are usually not recorded or communicated to other staff. As one of the physicians stated, "The nurses have to write down why this was ordered, what they have observed ... we need some sort of a concrete basis for saying yes, treat, or no, don't. It's the breakdown in communication [from the attendant primary care giver, to the nurse, to the doctor] where the problem lies." In general the nurses felt that the approach to ordering antibiotics in their facilities was fairly consistent and that staff physicians would order antibiotics only for patients with a change in their clinical status. Many of the physicians and the nurses appreciated the need for caution in prescribing antibiotics, citing both the problem of increasingly resistant organisms and a wish to avoid making patients sicker through possible side effects of antibiotics. It was a common strategy for those caring for residents to make a determined effort to take alternative action first, such as administering fluids. Study participants thought that education at many levels was necessary. This included educating nursing-home residents, who according to one nurse, "definitely believe when it comes to medication that more is better." Educational material was also recommended for residents' families who pressure staff to order cultures and antibiotics and need information about asymptomatic bacteriuria and antibiotic resistance. Education was also suggested for physicians who automatically order antibiotics for patients who are asymptomatic, perhaps in the form of an educational video that models cooperative relationships between nurses and physicians in communicating the issues relating to asymptomatic bacteriuria. Participants also discussed the value of communication from the laboratory on positive culture reports that would flag the need to know the patient's symptoms before treating with antibiotics. Some physicians thought this would be ignored after a time, whereas others commented that it would be a tool that would help them educate the nurses. Many residents of long-term care facilities are cognitively impaired and unable to articulate their symptoms.25 The physicians and nurses who participated in the focus groups described a variety of general indicators in residents that trigger their suspicions of a urinary tract infection and influence the ordering of cultures and antibiotics. However, an association between these nonspecific signs and symptoms and the presence or absence of bacteriuria has not been demonstrated.18 Thus, there is no evidence to support the practice of ordering urine cultures and treating positive cultures for these nonspecific indicators. Given the high prevalence of bacteriuria among institutionalized elderly people,1,2,3,4,5,6 these findings represent an important focus for educational interventions geared to health care workers who provide care to elderly residents in long-term care facilities. Another important finding was the central role played by nurses in both the ordering of urine cultures and the decision to prescribe antibiotics. This suggests that any intervention to reduce the prescribing of antibiotics for asymptomatic bacteriuria must involve nursing staff to be successful. The study revealed that education is viewed as an important priority by both physicians and nurses, not only for themselves but also for residents of long-term care facilities and their families to reduce the frequency of antibiotic treatment for asymptomatic bacteriuria. One useful area for education concerns the presence of pyuria in 90% of residents with bacteriuria.26,27,28,29 Physicians in the focus groups did not appear to appreciate the fact that in this population the presence of pyuria is of little diagnostic value for urinary tract infection.13 Although the absence of bacteriuria and pyuria may be helpful in excluding urinary tract infection, their presence is not helpful in "ruling in" such infection. Using serological evidence of urinary tract infection, Orr and coworkers30 reported that only 10% of institutionalized residents with fever and bacteriuria had a urinary tract infection. Similarily, positive results of dipstick tests for urinary nitrites or leukocyte esterase, which are screening tests for bacteriuria and pyuria respectively,31,32 are not helpful in confirming urinary tract infections in this population. Education for nurses about the lack of evidence for foul-smelling urine being a marker of urinary tract infection may also help diminish the number of specimens sent for urine culture, potentially reducing the chance that antibiotics will be prescribed. A summary of research questions generated by the data is provided in Box 2. A strength of this study was its open-ended and interactive methodology, which enabled participants to discuss the nuances of patient care within this population and the implications for the research question. A limitation of the study was that nurses from 2 well-organized nursing homes with well-educated staff took part in the discussions, so the ideas and attitudes of nurses less well versed in the issues were not directly represented. The fact that some physician participants were medical directors may also limit the generalizability of the results to other physicians who treat patients in long-term care facilities. Because selection of participants was voluntary, the opinions expressed may be skewed toward those who are concerned about these issues. We thank Dr. Dennis Willms for his helpful suggestions. We would also like to express our gratitude to the physicians and nurses who participated in the study. This study was funded by grant 98-04 from the Physician's Service Inc. Foundation. Abrutyn E, Mossey J, Levinson M, Boscia J, Pitsakis P, Kaye D. Epidemiology of asymptomatic bacteriuria in elderly women. J Am Geriatr Soc 1991; 39:388-93. Kasviki-Charvati P, Drolette-Kefakis B, Papanayiotou PC, Dontas AS. Turnover of bacteriuria in old age. Age Ageing 1982;11:169-74. Nicolle LE, Bjornson J, Harding GKM, MacDonell JA. Bacteriuria in elderly institutionalized men. N Engl J Med 1983;309:1420-5. Nicolle LE, Mayhew JW, Bryan L. Prospective randomized comparison of therapy and no therapy for asymptomatic bacteriuria in institutionalized elderly women. Am J Med 1987;83:27-33. Mou TN, Siroty R, Ventry P. Bacteriuria in elderly chronically ill patients. J Am Geriatr Soc 1962;10:170-5. Ouslander JG, Schapira M, Fingold S, Schnelle J. Accuracy of rapid urine screening tests among incontinent nursing home residents with asymptomatic bacteriuria. J Am Geriatr Soc 1995;43:772-5. Abrutyn E, Mossey J, Berlin JA, Boscia J, Levison M, Pitsakis P, et al. Does asymptomatic bacteriuria predict mortality and does antimicrobial treatment reduce mortality in elderly ambulatory women? Ann Intern Med 1994; 120:827-33. Ouslander JG, Schapira M, Schnelle JF, Uman G, Fingold S, Tuico E, et al. Does eradicating bacteriuria affect the severity of chronic urinary incontinence in nursing home residents? Ann Intern Med 1995;122:749-54. Boscia JA, Kobasa WD, Knight RA, Abrutyn E, Levison ME, Kaye D. Therapy vs no therapy in elderly ambulatory nonhospitalized women. JAMA 1987;257:1067-71.
Zimmer JG, Bentley DW, Valenti WM, Watson NM. Systemic antibiotic use in nursing homes. A quality assessment. J Am Geriatr Soc 1986;34:703-10. Warren JW, Palumbo FB, Fitterman L, Speedie SM. Incidence and characteristics of antibiotic use in aged nursing home patients. J Am Geriatr Soc 1991;39:963-72. Erberle CM, Winsemius D, Garibaldi RA. Risk factors and consequences of bacteriuria in non-catheterized nursing home residents. J Gerontol 1993; 48:266-71. Strausbaugh LJ, Crossley KB, Nurse BA, Thrupp LD. Antimicrobial resistance in long-term care facilities. Infect Control Hosp Epidemiol 1996;17:129-40. Wiener J, Quinn JP, Bradford PA, Goering RV, Nathan C, Bush K, et al. Multiple antibiotic-resistant Klebsiella and Escherichia coli in nursing homes. JAMA 1999;281:517-23. Swartz MN. Use of antimicrobial agents and drug resistance. N Engl J Med 1997;337:491-2. Hawkey PM. Action against antibiotic resistance: no time to lose. Lancet 1998;351:1298-9. Boscia JA, Kobasa WD, Abrutyn E, Levison ME, Kaplan AM, Kaye D. Lack of association between bacteriuria and symptoms in the elderly. Am J Med 1986;81:979-82. Berman P, Hogan DB, Fox RA. The atypical presentation of infection in old age. Age Ageing 1987;16:201-7. Green J, Britten J. Qualitative research and evidence based medicine. BMJ 1998;316:1230-2. Greenhalgh T, Taylor R. How to read a paper: papers that go beyond numbers (qualitative research). BMJ 1997;315:740-3. Kitzinger J. Introducing focus groups. BMJ 1995;311:299-302. Morgan DL. Doctor-caregiver relationships: an exploration using focus groups. In: Crabtree BF, Miller WL, editors. Doing qualitative research. London (UK): Sage Publications; 1994. p. 205-27. Boscia JA, Abrutyn E, Levison ME, Pitsakis PG, Kaye D. Pyuria and asymptomatic bacteriuria in elderly ambulatory women. Ann Intern Med 1989;110: 404-5. Nicolle LE, Harding GKM, Kennedy J, McIntyre M, Aoki F, Murray D. Urine specimen collection with external devices for diagnosis of bacteriuria in elderly incontinent men. J Clin Microbiol 1988;26:1115-9. Nicolle LE, Muir P, Harding GKM, Norris M. Localization of site of urinary infection in elderly institutionalized women with asymptomatic bacteriuria. J Infect Dis 1988;157:65-70. Rodgers K, Nicolle LE, McIntyre M, Harding GKM, Hoban D, Murray D. Pyuria in institutionalized elderly subjects. Can J Infect Dis 1991;2:142-7. Orr PH, Nicolle LE, Duckworth H, Brunka J, Kennedy J, Murray D, et al. Febrile urinary infection in the institutionalized elderly. Am J Med 1996; 100:71-7. Jones C, MacPherson DW, Stevens DL. Inability of the Chemstrip LN compared with quantitative urine culture to predict significant bacteriuria. J Clin Microbiol 1986;23:160-2. Pezzlo M. Detection of urinary tract infections by rapid methods. Clin Microbiol Rev 1988;1:268-80.